Interview as part of the BFP calendar 2013 to discuss BPF 2012 Danny Wilson Award work. Rebecca Drew is a trustee (and interim chair) of the Brighton Photo Fringe, involved since the very beginning, and instrumental in setting up the Brighton Photo Biennial, as it’s first coordinator and then a founding Board member. Formally Deputy Director of Photoworks and now Head of Finance and European Programmes at Fabrica. RD: I was one of the judges on the Danny Wilson Memorial Award last year. So I was delighted when Joan won, but it was a very close competition and the judges had heated debates about who should win. It was the originality of Joan’s work, it’s delicate beauty and its experimental nature, that won the argument. And the fact that Joan had been involved in two very successful Fringe projects. I am generally interested in work that is quiet and thoughtful. I call it Slow Art. Art that makes me think. And your work definitely draws on philosophical thinking. You started off studying philosophy? So how did you come to do an MA in photography here in Brighton? JA: I studied philosophy and minored in politics at Queens University Belfast, afterwards I worked in politics with an NGO while developing my practice, to the point where I was ready to do my MA. This took about 5-6 years. I taught myself through doing foundation art, took various short term courses including studio lighting and pinhole photography. Then I successfully applied for an Arts Council Award grant, did a residency at PAF in France and volunteered at Belfast Exposed, working as a gallery assistant in return for the use of their facilities. RD: And the link to your philosophical studies is very important …. JA: Yes. Reading, and linking texts into my work, absolutely goes hand in hand with my photographic work, I read quite a lot, and it’s not that I illustrate texts with my work but I like how the texts I use are really important, both as an influence in what I make and in getting me to the point of getting out there to actually make work. I think this is why it takes me quite a long time to make work because there is this incubation period. I do get worried at this stage and am relieved when I finally start producing something and gathering source material, finding that the texts I’ve been reading overlap and coincide eventually in my ‘finished’ work. Let’s start with your Shadow Dial Studies series – you map shifting shadows with chalk, they’re like a kind of scientific experiment to capture the intangible. You’ve said you want to ‘interrupt, imprint and record layers of time’. JA: The first images here weren’t actually in my MA show but they were key pieces in the overall project. Blue Room consists of a shadow dial created from 11 am – Noon. To make a Shadow Dial, each 10 minutes I draw a line between the shadow and the light – or more simply I trace around the shadow lines. These pieces are very time based and I tend to print these particular ones quite small so the viewer has to look very closely at the lights movement. In the next stage I transfer these onto tracing paper by tracing the chalk lines onto tracing paper with pencil, which is where they become physical maps, and finally I stick these maps to a window and photograph them as slides. 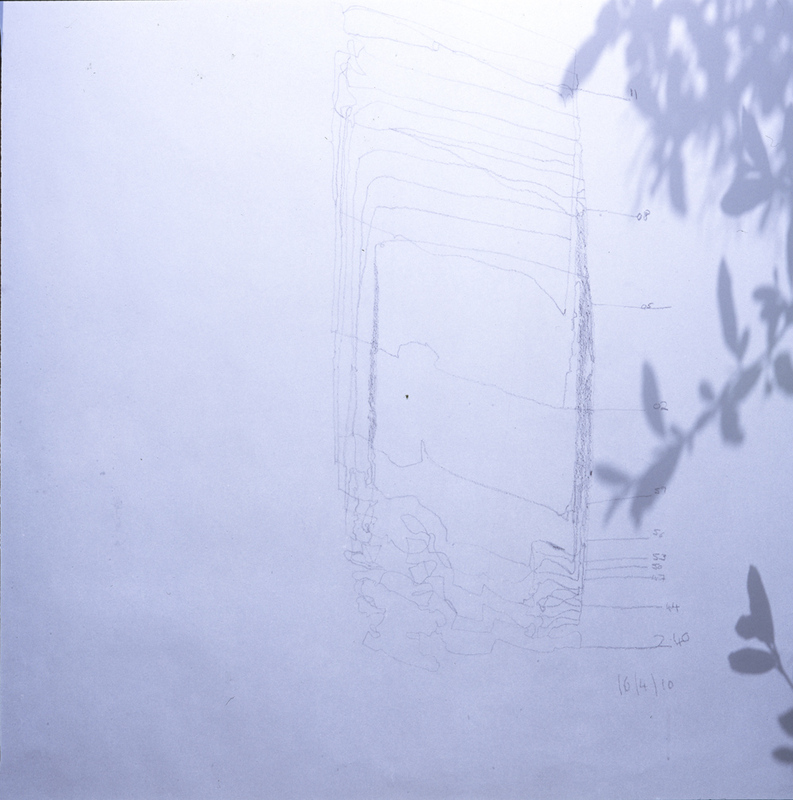 There were 2 Shadow Maps in my MA show, Sunrise and Solar Noon. These drawings were and still are at the core of my work, they are made in a process which begins with watching light and tracing shadow lines in order to measure and interpret them. I wanted to collect and file them, in a way to collect invisible things, I began making these shadow dials after my foundation art project , working mainly in three locations over a period of three years before collating them into Shadow Dial Studies in my MA. The idea behind this is to hold time in works that are informed by light, weather and the layout of the place or building I am in. RD: So what fascinates you about shadows? JA: When I watch shadows I am totally drawn in because I think they are so visually beautiful but also really interesting, For me they are loaded with philosophical meaning and history, they are ciphers for a lot of my thinking on finitude, death and being human. Shadows reference passing time , they are at the origins of how we measure time (the first ideas of the sun rising and setting being ,measured using sun dials) and in so shape how we perceive and structure our lives, our ‘being’ in time. Alongside the Shadow Dials you presented two other major works for your MA show. Normandy Figure was made during a residency in France. It was presented as a series of images in a lightbox and you also made it into a beautiful little editioned book. You showed this work in the fringe in Velo Vitality , a bicycle shop because it was made on cycling trip? JA: I made Normandy figure during a cycling trip to France before my residency and MA but continued making the work for years afterwards. Finally now, when I see the work it feels like watching shadows, and that was the aim , to merge the shadow and the ghost with this lady. RD: Can you describe how this happened? JA On the cycle from Mont St Michel back to Cherbourg we stopped for lunch in a village. It was siesta time, and I went for a walk. When I saw her form across the square, everything was still and really quiet, there was no one around at all, the square was empty. Everyone was indoors I think. It was quite an uncanny feeling, even more so because of where she was, what she was wearing and the emptiness of the surroundings. At first I was quite taken aback, and just stood and watched, I think she did remain in the window for a long time, it felt as if she was timeless, it may only have been 10 minutes, I don’t remember. I didn’t take a picture and walked around the square, she was still there when I got back and I started taking pictures, to avoid approaching her even I zoomed in. She was still there when I left. Later that year in December, between times (between taking these pictures and processing them) I had visited a cemetery in Lisieux Basse, Normandy) on my way to my residency in St Erme, Picardy and made shadow cut outs out of some of the St Therese figurines on the gravestones. Then during my MA I made Normandy series taking the lady out of her window and letting her move around the space and time of her original place, where she had been imprinted on the emulsion. RD: I think there is something very uncanny about her. It’s like a Hitchcock movie. And then you disembodied this woman and you cut off her shadow like Peter Pan. She then seems to fly out of the window. You take her into a kind of theatre, a shadow world, a shadow-puppet theatre. It seems to be about photographic processes because your manipulating the image by taking a still photograph by zooming in, and then zooming completely out and releasing the image into a new space, into a new life in the darkroom. She is disembodied and then re-embodied. Like that old idea that the photograph steals the soul. There is something very ghostly about this work. (Like Cinders – never the same as what was burnt.) Do you believe in ghosts? I believe in what we can’t see, in gaps of memory and time, of overlaps of past and present and the role that perception pays in our reality. Whatever results in ‘seeing’ a ghost, the idea is very important to me, in terms of in terms of understanding and finding out about life, and also ghosts are a natural product of death which is one of the few certainties we have. This piece of work became quite important for me. I used it to really experiment with my ideas. I found I could literally use it to demonstrate and explore what photography, or the photographic process, does by exaggerating and delaying stages of it : tracing light, duplicating lines , transferring, enlarging , exposing , using negative and positive, switching unseen for seen . I traced the ladys profile and repeated it, essentially taking her shadow out of the picture and recasting her into the picture as light moving backwards and forwards towards her. I duplicated these and cast her shadow in the studio using lights and a wire stage. 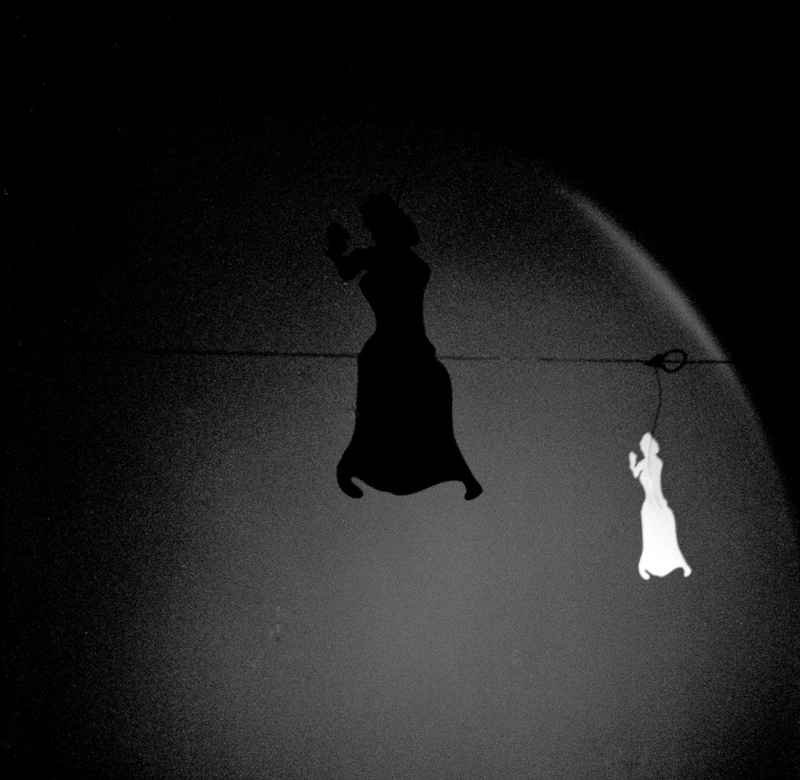 After that I used tracing paper in the darkroom to duplicate the scene, I placed the anonymous lady in a sort of 2D shadow theatre by making a photogram collage or tableau. I also made a book as a separate piece which contained images of the rest of the village during the same siesta time combining them with the studio pictures. They were shot on black and white and printed quite small so already looked dated and out of time. It became a very rich piece of source material for me, being quite an uncanny scene to begin with and allowing me many ways to experiment and push the material in the darkroom and studio. This all ties in to my understanding of photography’s relationship to the indexical and as an index how elusive it is. Despite drawing on ideas of time and indexicality, my work always tends to come back to very practical experiments in the darkroom or with very simple subject matter, such as dust, a window washer , ashes or empty rooms. RD: The third piece of work for your MA is also quite haunting. 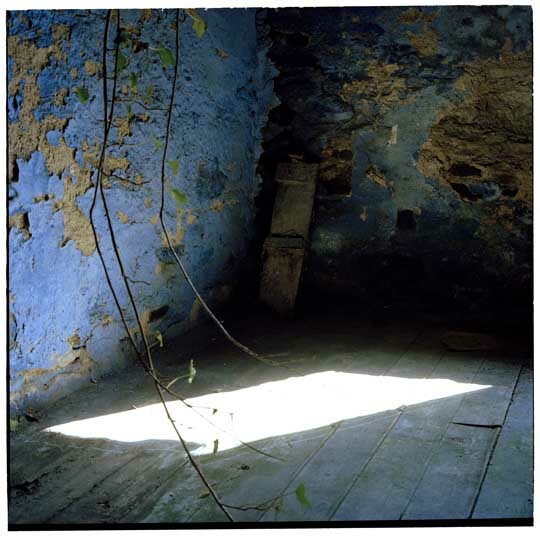 It was an installation entitled Dust shot in Rylagh, an old dilapidated house belonging to your family in County Tyrone. JA: Dust the video was made while I was preparing or sweeping the floor there to make a shadow tracing with chalk, I saw the dust in the light coming through the window and recorded it. As a child I always tried to ‘hold’ the rays that came through windows, reaching out to touch them, in the moment really believing it would be physical. The dust here, makes the light tangible, it becomes the lights channel. Afterwards when I watched it the work became very significant. It references photographic equipment through the visual echo of dust in the light rays from a projector beam, and this is why I made a slide to project in my space of the broom that I used to sweep the dust. RD: I’m particularly struck by references to photography’s history throughout your work, Dust obviously references Fox Talbot early image of a broom. And the woman in Normandy Figure seems like a cipher for the first photograph emanating from Niepce’s window. 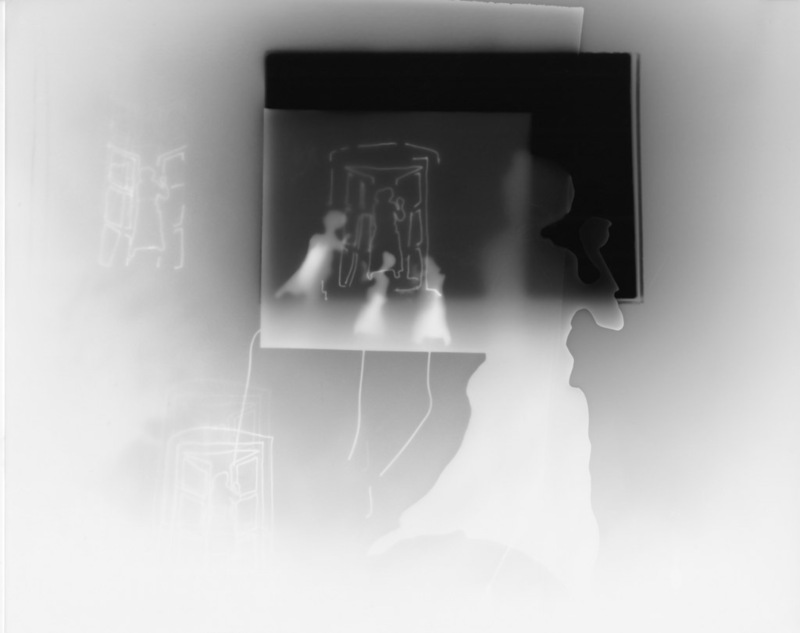 You also create links between the past and present with your use of different technologies, photograms and lumigrams, black and white film, an old fashioned slide projector juxtaposed with a digital film projection. And as we’ve discussed your interest in history and the passage of time is evident in the subject matter, dust and the sweep of history. You have said that your work engages with Fox Talbot’s belief that photography shifted our understanding of light by turning time into space. Can you explain that more? RD: So you’re investigating the ontology of photography in your work? 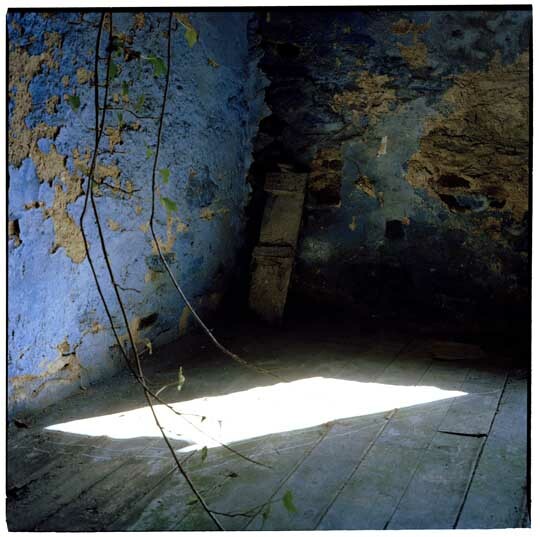 JA: Yes, I do this through investigation in very simple ways, like what I did in Normandy Figure, stretching out the photographic process, experimenting with its basic elements – its relation to light, shadow and time. Using a variety of photographic techniques to experiment and investigate as part of an ongoing photographic process I try to literally re draw time by tracing, transferring and recasting shadows. Following on from Fox Talbot, even though we have numerous means and devices to record and store images now, using ‘live time’, seeing the present as it happens I really like returning to the idea of fixing because now that even though we can ‘fix’ an image we still cant ‘fix’ time, it keeps eluding us, despite living ‘in’ it. Shadows and technology always ever evading us and we are still just as unable to access the present and the past passes through it. In the early days of photography at its invention, the quest was to fix an image, to hold time, and it was frequently lamented that the images faded distressingly quickly. Now of course we also have apps and devices where there is no desire for permanence, there is a keen need to keep images moving with us. Shadow and technology both move and evade us. RD: And at the same time your video evokes the mundane work of sweeping the floor, the magic of the everyday. Your lumigrams are the simplest form of photography, it’s as if you are trying to condense down complex notions of history and philosophy into the most succinct formal expression. Your Dust film reminds me of Michael Snow’s seminal film Solar Breath, an hour long film of a curtain fluttering in the breeze – yet another window! Can you talk about the formal simplicity of your work and artists that have influenced you? 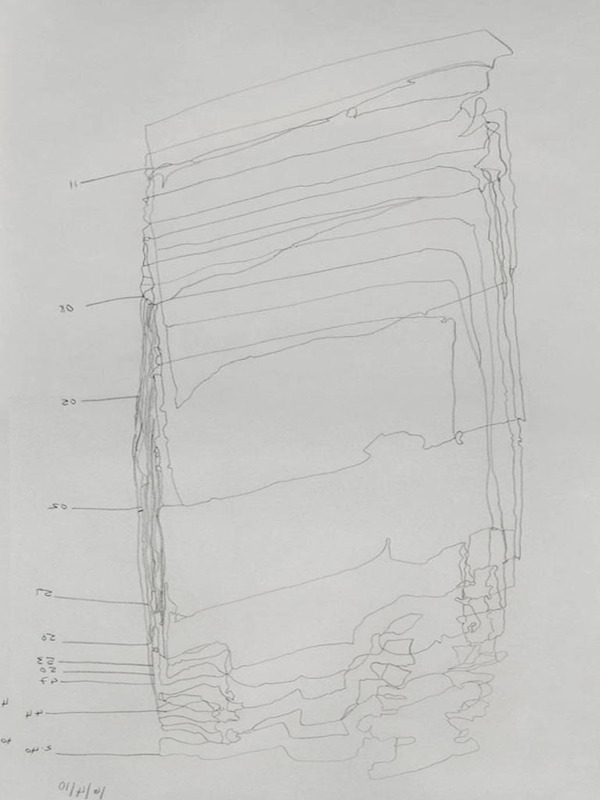 JA: I like land artists such as Nancy Holt and Andy Goldsworthy, works that use natural light and temporal cycles to create work that is almost already there….I also like diagrammatic graphs and icons, works with annotations and that invite interpretation quite literally. I also at the same time like very large images with very simple aesthetics and that give minimal information. I enjoy looking at Muybridge, or scientific diagrams or maps. RD: And this is what your shadow dial series is about, mapping and tracing…. RD: Your work to me often seems like a mad pursuit of containing the uncontainable. It is often informal , always tangential, and a working through, a progress, shabby even, but is romantic and beautiful, elegant and refined. The intensity with which you focus in on the smallest of details makes me wonder if this is a deliberate turning away from politics and violence? You’re from Omagh in Northern Ireland. Home of the Troubles, and a terrible car bomb in 1998. JA: While I grew up in a province with a substantial and regular amount of tension and loss my work, or my subject matter is not about ‘The troubles’, I think that growing up during them certainly influenced my outlook on life. I wasn’t aware of this until I got older as it was always just normal, life always continued very normally. In hindsight I can see that the environmental impact of sectarianism, borders, definitions and religion was quite defining and it felt quite claustrophobic. I would find watching light moving and the shadows return beautiful and curious, it made me feel like something ‘big’ was happening despite all; despite political ‘incidents’, definitions or religious reasonings. It wasn’t that this was reassuring, but it felt timeless, universal and important to witness, it gave me somewhere to go and was interesting . RD: You’ve told me that you feel the need to return home to make work and you’ve just got back from a trip. You have a very nice studio here so what it is particularly about the context there that sparks your creativity? JA: In terms of going home to make work, I feel like I know the space there, the shadows and the fall of the light in a way that matters, so making work is now what I need to do there….also practically , my work is durational , it takes a long time to make and i have the peace of mind, solitude or isolation to make it there. RD: Your current work in progress Shadow Dials Part II has you trying to trace the difference between a moving object, here a tree moving in the wind, and it’s shadow. RD: When I see this shed I immediately think of Walker Evans, and his clapboard houses, but also the formal lines of the wood are a kind of graph that evokes your shadow dial studies. It’s another impossible experiment. JA: Yes. A shadow is never separated from its object, it is its twin, so this work is trying to catch the visually imperceptible space between the object and its shadow. In this way it starts to become clearer it’s about the space in between, that space that is often un noticed, and hard to measure. RD: Alongside this you are making a body of work about cinders, following on from your work on Dust. You’ve filmed the remnants of burning papers and have made a series of still images of the ashes in a round jar. Can we have a sneak preview of this new work? RD: For me this inevitably evokes death, and the holocaust and the Troubles and also Carol Mavor’s writing on Hiroshima that I know is important for you. JA: Shadow and the latent image are themes I am really keen to develop through my work. In ‘Summer Was Inside the Marble’ Carol Mavor discusses involuntary memory, through the shadow without a referent, no referent because it had been incinerated in the Hiroshima atom bomb. This is a memory that she said must be told but in a radically different way because the ‘image’, this shadow, is no longer indexical. My Cinders’ work is about mourning passing time. It draws on Derrida’s writing about memory, mourning and death, in ‘Athens Still Remains’, on the impossibility of seeing history; a moment just passed or previous spell of time, exactly as it was. Basically about the absence of what is past -burnt, in its presence -cinders. 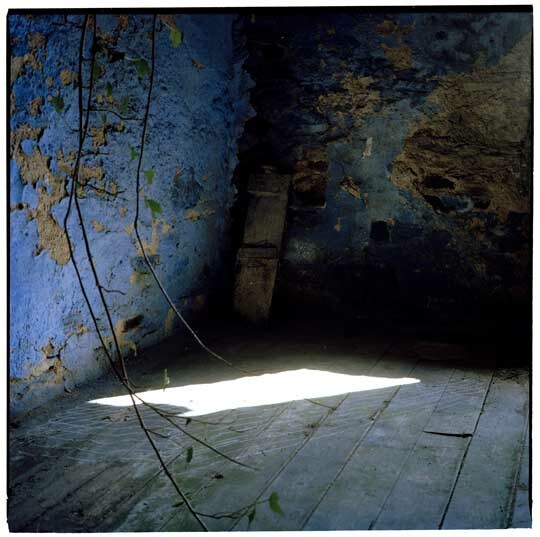 Derrida talks about ghosts, traces and cinders to address the memory by which we construct ourselves and the idea that everything is infused with mourning, death is ever present and ever elusive. I have literally used cinders here, ones burning at my parents home, to begin this line of inquiry, referencing strongly Derrida’s ‘Cinders’, where Cinders is a motif for a radical destruction of memory. RD: It seems to me that your work attempts to draw out the magical qualities of photography. Given your interest in shadows, ghosts, and cinders, it came as no surprise that your latest project is about fairies! Fairies have been a subject for photography since it’s inception, and Fox Talbot described his early photographs as his ‘fairy pictures’. 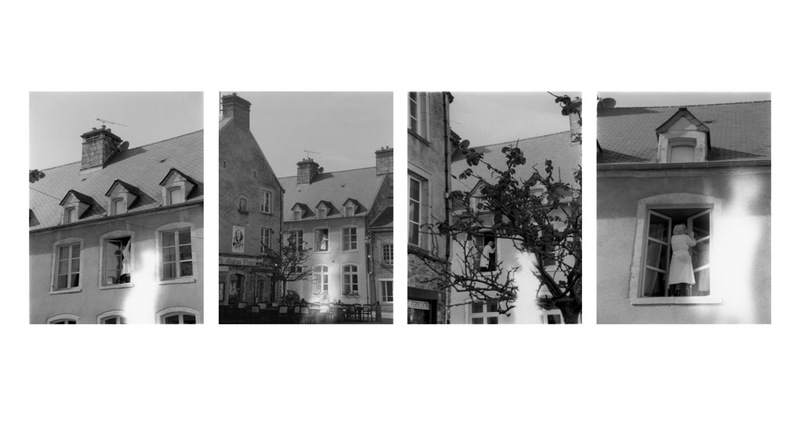 This new project is called Light, Line and Lore and links storytelling with photography and its relationship to collective memory. Can you tell us more about this and describe what the project is going to be? JA: I have started working at the sites of fairy thorn bushes, which are actually just regular Whitethorn bushes, but they have grown alone, not in a hedge row, and are said to be inhabited or protected by and for the fairies. So they must on no account be harmed, cut down or even touched, otherwise bad luck will befall the person who does, and their family. Because of this I am working carefully around them! I am interested in them specifically because there is a strong link between shadows and fairies, both are impossible to capture and they are ciphers for ideas about transgression, liminal states, the intangible. Within the tradition of fairy folklore is a strong preoccupation with boundaries between one world and the other. 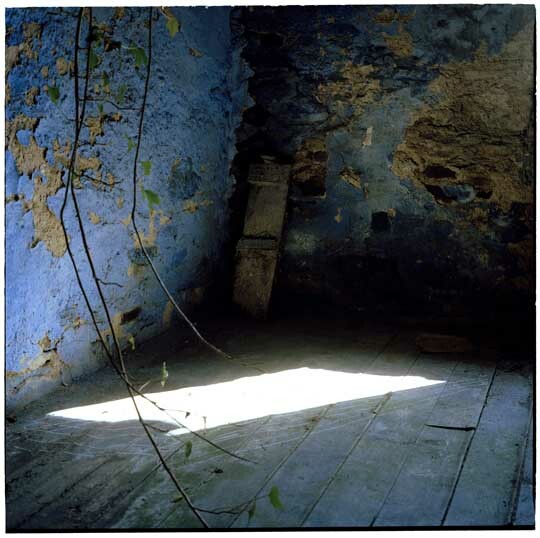 My work considers the line between shadow and light, a line difficult to trace and identify. With this metaphorical resonance, I’m exploring how verbal histories, folklore and legends are stored in the memory and age with the ebb and flow of the memory keeper, who in their recounting of them, cast vivid stories and influence. I’m referencing Derrida again in ‘Athens Still Remains’, where he writes about the relations between photography, light, writing, memory, mourning , death and survival. The book is short and questions whether the boundary between light and shadow constitutes a line, and this meditation is the conceptual origin for my new work on fairy folklore. Within the tradition of fairy folklore is a strong preoccupation with boundaries between one world and the other, and as shadow mapping considers the line between shadow and light, a line difficult to trace and identify to be significant, I plan to explore this ‘non area’, and relate it to the photographic latent image, the undeveloped area of light caught between times of capture in the darkroom. I plan to do this by working in a place that has a strong connection to folklore and fairy legend in Ireland in County Tyrone , Derry and Donegal, as it is from here that my family originates and here that the ideas and stories of fairies were first instilled in my memory. Where a lone thorn bush, or a fairy bush grows will determine where this line will be, as it was ‘borne from a seed that was never planted’, mythically , it has no known referent. 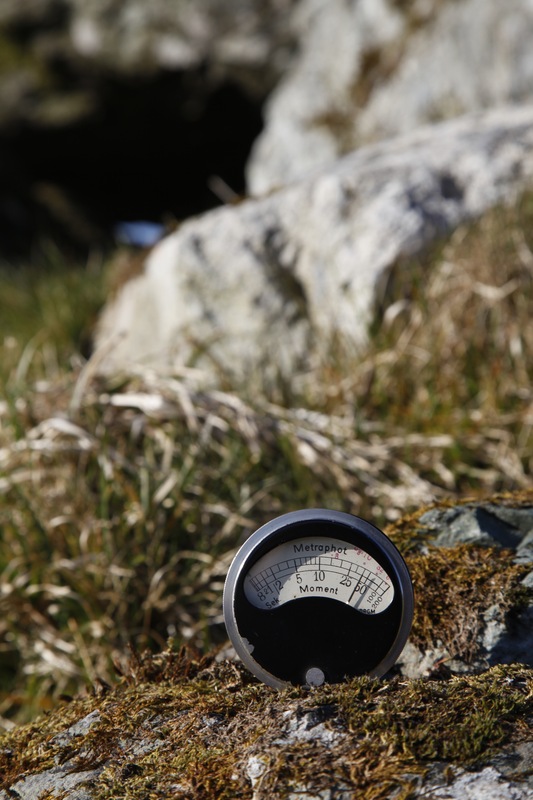 RD: We end with this image of a light meter on the border of a fairy thorn in Loughmacrory. You placed it there to mark , or measure the liminal space between shadow and light., and the boundary between where its okay to go and not okay to go, according to fairy folklore. JA: In the same way that falling light makes us measure time and structure our lives, fairy sites and stories impact culture and lives in Northern Ireland, it is cultural trope, but also more universally these stories also hold fast. There are loads of stories, folklore, relating to ghosts. RD: You have been reading ‘Passing the time in Ballymenone’ by Henry Glassie, a great book that explores the value of storytelling, and how it makes sensate things invisible, essentially relating to Barthes’ idea of the Punctum.